As one of seven speech language pathologists  (SLP) at the Children’s, Caroline is a good example of how varied that work can be. 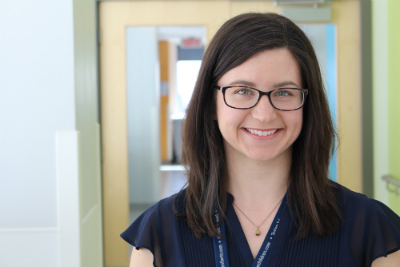 She not only sees inpatients with brain tumors or traumatic brain injuries but she works with outpatients in the developmental progress, autism spectrum disorders, and neonatal follow-up clinics. SLPs often specialize in areas of speech or language, and Caroline’s work frequently focuses on language skills and abilities. Caroline says that while the Speech Language Pathology department’s mandate prioritizes evaluations, they’ve recently created more opportunities for patients to have diagnostic therapy following evaluation. Following the evaluation or diagnostic therapy, many patients are also referred for subsequent services and intervention at CLSCs or rehabilitation centres. SLPs in the department help coordinate the continuity of services in the community.